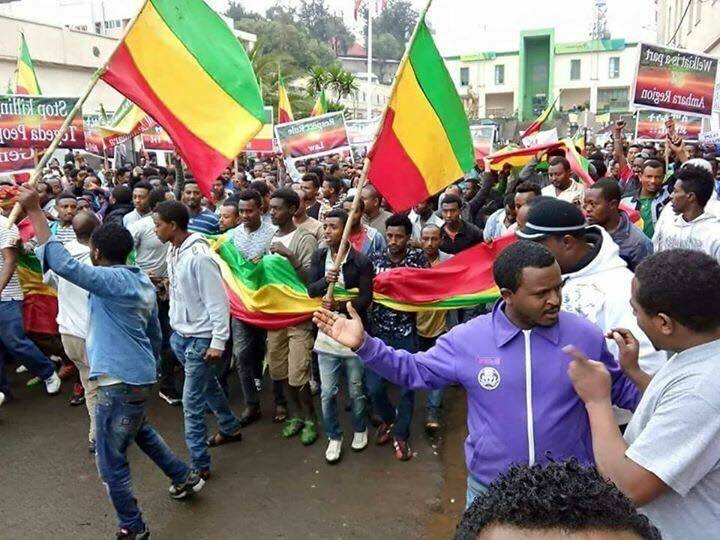 Protests have shaken Ethiopia on and off for years, but during the latests months – not to mention the last weeks – the protests have grown. What started as a protest against a plan threatening to expand the capital city into the land of the Oromo farmers, have evolved into a protest against decades of oppression by the Ethiopian regime. The protests of the Oromo people, the largest ethnic group, has been joined by the Amhara people who also have faced grave abuses by the government. The two groups are now demanding their freedom together. The security forces of the Ethiopian government have not been late to respond. They are seriously hurting, killing and arresting peaceful protesters. In a video published by the Swedish Television (SVT), a police kicks a man in his face, a man who is already lying on the street. Other polices are seen beating protesters using a baton. In yet another video, the police is shooting at peaceful protesters. What is it that makes the police treat peaceful protesters this way? I believe it to be fear. Fear of change. Fear that the protests will spread and that they will be unstoppable. Freedom is the core of the human kind, and it will always be wanted, always demanded and claimed. A protest a direct way of using ones right to freedom of expression. While the people were protesting the most, the Ethiopian government blocked the Internet. This is probably due to two major reasons. The first one is that they got something to hide. They do not want the world to know how they treat the people. The second is that they fear that reports of their acts will cause a rage, making the protests to spread. Fear of protests and online reporting is a fear of freedom of expression. The international media has finally noticed the freedom struggle of the Ethiopian people. That is good, but they should have noticed it a long while ago. They should have noticed it while the Ethiopian government jailed journalists, bloggers and human rights activists; while innocent people were jailed and tortured in the Maekelawi investigation centre. They should have noticed it before more people were jailed and killed. Why are the governments of the world (such as the Swedish) not doing anything to stop the oppression in countries like Ethiopia? How long are they going to wait before taking action? To the contrary, they are feeding the oppression by providing aid money while overlooking violence and non-existing democracy. Ethiopia is a giant prison where people are not allowed to freely express themselves. The Ethiopian government has deprived the freedom of all people – be it a journalist, a farmer, a student or a business owner. The government oppress everyone who has a mouth to speak their rights with or who use a pencil to tell the truth. But the country will not stay a prison forever. The longing for change is burning like a fire within the heart of the people. The protests, online and offline, is likely to continue until the government understands that freedom is a human right entitled to everyone. “Man is free at the moment he wishes to be”.